I am pleased to report that my body is giving me the power I need to meet all of my cycling goals thus far. I rode 94 miles on Thursday, by far the longest I have ridden since an ill-considered 100-mile ride from Providence, Rhode Island to Martha’s Vineyard when I was 19 – on a 3-speed bicycle!I have an interesting suntan with various stripes and triangles where my skin is exposed during the day. We have spent this Shabbat resting in the desert town of Mitzpeh Ramon, and we will bicycle away tomorrow morning for the far south of Israel. On Friday as we departed Ashkelon we rode past an enormous coal-fired power plant, one of the major sources of electricity in Israel. Israeli companies have recently discovered enormous reserves of natural gas in Israeli waters in the Mediterranean, so it is possible that within a few years Israel’s reliance on foreign coal will diminish, replaced by its own sources of cleaner-burning natural gas.Israel also has an ideal climate for harnessing solar power; we will be touring a solar installation later tomorrow. A bit south of the power plant we paused at a holding reservoir for a kibbutz. We had by now entered the arid northern Negev, and the JNF (Jewish National Fund) has made a huge investment in hundreds of reservoirs for these southern communities. The very clean and potable water we were looking at is treated wastewater. Alon Tal explained to us that fully 50% of Israel’s agricultural water use is treated wastewater, and the goal is to continue to increase that ratio. As I bike through the desert and consume quarts of water a day, my appreciation for carefully managing water resources becomes especially acute. Spread out beyond the reservoir, stretching north and south, was the entire Gaza Strip. There are approximately 1.8 million people essentially trapped in an area about twice the size of Washington, D.C., people lacking citizenship, people that no one in the Arab world, let alone Israel, has ever wanted to claim as their own. Only the tiniest percentage of Gazans can currently with much diplomatic effort even get out of Gaza, whether to Israel or to Egypt. Ashkelon, where we had just spent the night, was a frequent target of Hamas missile attacks from Gaza. In 2009, Israel launched a massive military campaign against Gaza, and since then the missile attacks have almost entirely ceased. Now Gaza languishes in political stalemate and semi-ruins, under an Israeli blockade and under its own repressive and corrupt Hamas leadership. It is a historically complex and humanly tragic situation that I will not attempt to analyze in this posting. As we bicycled southward parallel to the Gaza border, it was eerie and troubling to stare across the quiet open fields toward the urban clusters beyond. The remainder of the day my attention was mainly focused on pacing myself and making sure my pedals were moving. As we headed south the landscape became more and more barren. In the late afternoon we arrived at Nitzana, on the Egyptian border. Nitzana is a fairly new community, founded 24 years ago by Lova Eliav, one of the unsung heroes and visionaries of Zionism. Eliav just passed away this May. Among many accomplishments in his long career, he championed human rights and immigrants’ rights. I became familiar with Lova Eliav through his book “New Heart, New Spirit: Biblical Humanism for Modern Israel”. He envisioned Nitzana as a new oasis, an educational community in the desert on the border with Egypt. Today there are groves of trees, reservoir ponds, an educational center, and greenhouses producing sweet fruits and vegetables. It turns out that there is a huge aquifer of brackish water under that part of the Negev that has never been tapped, and is suitable for agriculture. And there is a gorgeous swimming pool, in which I rested my weary muscles. Nitzana sits on a rise a short distance from the Nitzana Crossing. This is the main commercial border crossing between Egypt and Israel. When Israel returned the Sinai Peninsula to Egypt in exchange for a peace agreement at the Camp David Accords, the Nitzana border crossing was created. The crossing is well used; an average of 200 trucks pass through a day, I was told. Early Friday morning we headed out on our ride. We were permitted to ride on a road the military uses to patrol the border. This was a particular treat for a biker, as we encountered no cars for better than 30 miles, and cruised through wide-open desert landscapes. The border patrol is mostly occupied these days interdicting drug smugglers. Across the barbed wire fence bored Egyptian sentries perked up at our convoy, sometimes waving. We then climbed into the more mountainous southern region of the Negev. After a particularly brutal hill (I walked much of it!) we reached an overlook of the wilderness of Kadesh Barnea. The Torah states that this is where the Children of Israel camped for many years, where Miriam passed away, and where Moses struck the rock and water streamed forth. Around the next bend my attention was jolted from the mythic past to the exigencies of the present.Six African men sat on the ground in front of a small military station. Our guide was David Palmach, the head of Nitzana and an avid biker. He explained that the Africans had walked across the border from Egypt during the night, and were looking for refuge. I had just been looking at the place where the Children of Israel, a band of escaping refugees from Pharaoh’s Egypt, had camped, and here I was looking at new refugees probably from the Darfur region in southern Sudan. 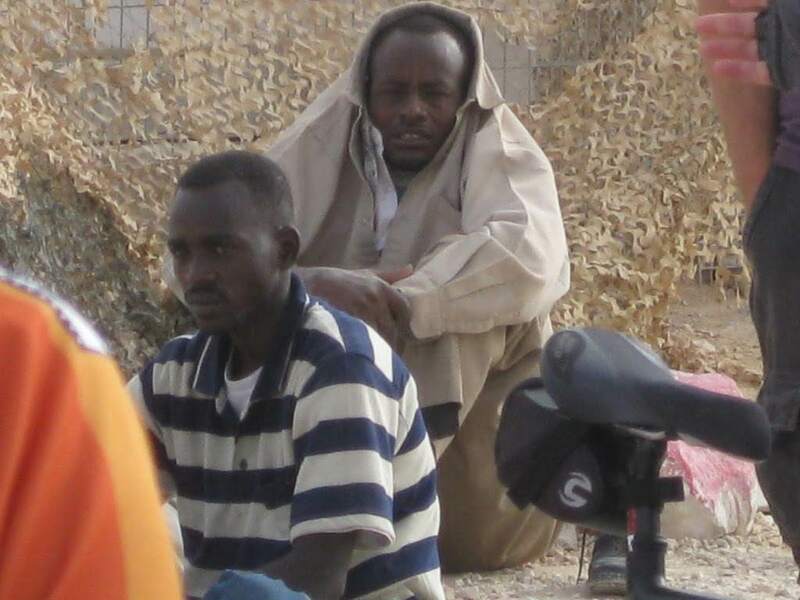 You are likely to be familiar with the chaotic and shockingly brutal degradation and slow genocide that is being perpetrated against the Darfurians by Moslem militias from northern Sudan. I learned that an average of 30 Africans a day make their way across the border into Israel every night. Ironically, the word is out in East Africa that Israel is the safest place to go. According to David Palmach, the refugees make their way across Egypt at great risk – the Egyptians deport them or kill them. The refugees pay Sinai Bedouin to guide them to the border. Once here, if the individuals are from Kenya or other East African countries from which asylum is not considered a life-or-death matter, they are sent back to their home countries. But if they are from Darfur or Eritrea, the Israelis give them asylum. They are taken to a nearby camp where they receive free food, shelter and medical and dental care. If I understood correctly, there are several thousand Darfurians currently being given safe asylum by Israel. We biked on through the day and rolled into Mitzpeh Ramon in plenty of time for Shabbat. Mitzpeh Ramon is a town created in the 1950’s as part of David Ben Gurion’s plan to settle the Negev. The town is perched on the edge of a stunning view of the Ramon Crater, a huge, deep gash into the Negev highlands. The first residents were new immigrants from North Africa, basically dumped in the middle of nowhere. When I first started visiting Mitzpeh Ramon 15 years ago with groups from our synagogue, the town was a depressed backwater. Today Mitzpeh Ramon has been discovered. As the center of Israel has become more congested, more affluent Israelis have spread out to the periphery, and Mitzpeh Ramon has grown into a very pleasant town. One more experience before I close for today: this afternoon we listened to a panel of graduates from the Arava Institute for Environmental Studies. They were a beautiful group of young adults primarily from Israel, Jordan, and the Palestinian Territories. It was simply inspiring to listen to them.Barak, a mechanical engineer from Jordan with a charming sense of humor, spoke about spotting an advertisement in the Amman newspaper for an environmental scholarship. The ad didn’t say where the scholarship would take you, and that was intentional. Even though there is a peace treaty between Israel and Jordan, for Jordanians Israelis are simply “the enemy”. Fraternizing with them is simply not done. When Barak learned he was going to Israel, he almost bagged the entire idea. But he had relatives in Jerusalem whom he had never met, and he decided to come for a week, stay long enough to meet his relatives, and then leave. After the first weekend at the Arava Institute, Barak decided to stay. He is now working on his Masters degree in environmental engineering at Ben Gurion University, working on creating viable hydrogen fueled engines. Each story was equally moving, as idealistic young people have found a place where they can pursue both repairing the world and repairing, or should I say, creating relationships with “the other side”. One reason for the Arava Institute’s documented success in creating relationships among its students that continue as personal friendships and professional colleagues is the required PELS seminar that is part of the curriculum: the Peace-building and Environmental Leadership Seminar.This is the “encounter group” of the program, and the participants are encouraged to express themselves freely. Obviously discussions become very heated at times. But these students are together for a minimum of 4 months, rooming and eating together on a kibbutz in the middle of nowhere, and so they must continue to deal with one another. The result is many lasting friendships, based on hard-won honest encounters. These friendships then extend into family visits, which are almost unheard of between Israeli Jews and Palestinians or Jordanians, and shared environmental projects, all supported in thoughtful ways by the Arava Institute. Wow. You can learn more about the Arava Institute at www.arava.org. Sunday morning we bicycle down the switchbacks into the crater! I will write again soon.